Hire CDJ2000 Hire CDJ900 and CDJ850 from our hire department. Our hire price is only $30 Each Unit - That's Sydney's Cheapest price. The CDJ-400s cosmetic design is simple and compact yet elegant with all of its various controls and features located directly on top of the unit. A USB port found on the face of the player allows DJs to play their MP3 music collection from a wide variety of portable music devices such as thumb drives, MP3 players or external hard drives. With the use of a multi-function selector knob/button and its large, bright, dot-matrix LCD display, locating and accessing of files from these types of music devices as well as MP3 music files on CD and CD-R/RW through the CD slot are done with a turn and press of the knob. As you'd expect, the CDJ-400 can control DJ and music application software. This is achieved by simply selecting the PC Source Select button, so that virtually all of the deck's buttons and slider can send MIDI control data via the PC USB connection. So when MIDI is the message, the CDJ-400 definitely delivers. For example, a DJ can connect the CDJ-400 to a PC or MAC and play and manipulate files from their favourite DJ application software - such as Pioneer DJS or Serato Scratch - and this doesnt even require a time-code disc to be used in the deck. With a design inspired by the club standard CDJ-1000 Jog Wheel comes the CDJ-400s 115mm illuminated platter. You can choose from six different patterns of Jog Wheel illumination and even personalise your own CDJ slip mats or jog sheets. A highlight and an advancement of the CDJ-400 is its scratching capability. In addition to traditional vinyl mode scratching, Pioneer implemented the worlds First Scratch Jog Effect. 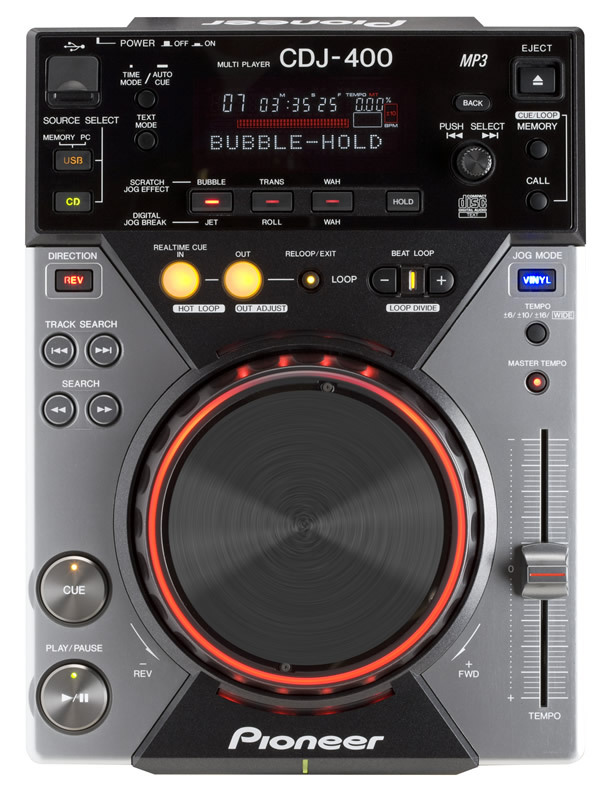 Three highlighted buttons, each assigned to a special effect, Bubble, Trans and Wah, creates unique scratching sound effects that can be enabled by the DJ on the fly. A hold button was also added to retain the different effects throughout the session or until its release, which can also be triggered at any point of play. Making the magic of live mash-up even more manageable, the new Beat Loop Divide facility rhythmically dices loops to fashion beats with drama, intrigue or whatever your desired effect. It is easily adjustable during loop playback, thereby creating loops with mind-melting, dance floor-destroying twists. Besides the Beat Loop Divide, the CDJ-400 lets you create flawless four-beat Beat Loops and Hot Loops. For the latter hit the Hot Loop (In/Out point) buttons during a loop to retrigger the loop. Up to 10 Cue/Loop points per disc, for up to 920 discs, can be stored in memory and transferred by usb key between CDJ-400s. Digital Jog Break: In CD mode the CDJ-400 contains three effects, Jet, Roll and Wah, which further enhances the audio by simply rotating the jog dial. The same buttons for the Scratch Jog Effect are assigned to the Digital Jog Break which are accessible at any point of play . This allows us to have long and convenient hours to suit you. Show Room is only 2 minutes walk from Campbelltown Train Station. And Easy Access from M5 Motorway.